It’s hard to believe, but the kids are almost out of school and Philadelphia Comic Con is just around the corner! It kicks off Thursday, June 19, and goes through Sunday, June 22. That’s the weekend after this one! As you may have noticed, I’ve cut waaaaay back on my convention appearances. Aside from Emerald City Comicon in Seattle and (possibly) Baltimore Comic Con, this is the only convention I have on my schedule at this point. If you’re coming out to the show, here’s how you can find me. I’ll be directly across from one of my all-time heroes, Neal Adams! 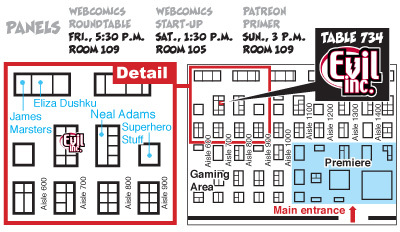 The good news is that I’ve got a ton of great stuff lined up for that weekend — books, panels, consultation opportunities, and more! Unfortunately, the eighth Evil Inc graphic novel will not be available in time for the show (in fact, the Kickstarter to fund the book will be wrapping up right around the start of the convention). However, this is a great chance to pick up my new tutorial, The Webcomics Handbook. In fact, you can get your hands on one of the limited-edition hardcovers that aren’t available in stores or online. Either way, it’s a great opportunity to pick up a book that covers webcomics — art, business and beyond — from the top down. And, of course, if you don’t have the earlier Evil Inc graphic novels, this is a good time to pick them up, have me sign ’em and do a personalized sketch for you. I’ll also have copies of some of my other books there — like Phables, a collection of comics about everyday life in Philadelphia. I’ll be hosting three tremendous panels during the convention. The world of webcomics has undergone its biggest upheaval since its inception. From the new ComiXology app to Net Neutrality, from Kickstarter to Patreon, there’s an awful lot to keep track of. Webcomics veteran Brad Guigar gathers a roundtable of webcomics notables to talk about these questions and much much more! Wanna start a webcomic? Sure. We all do. But where to start. 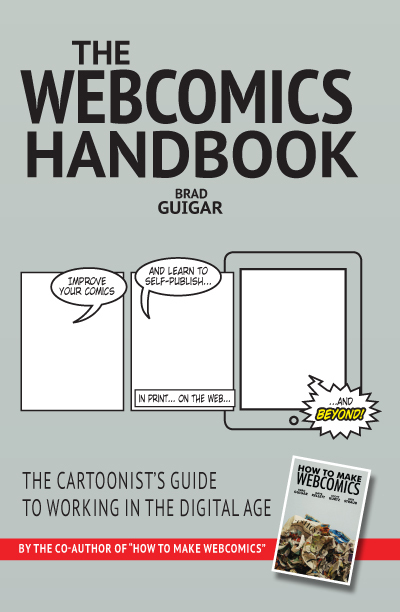 Brad Guigar, author of “The Webcomics Handbook,” — the popular sequel to “How To Make Webcomics” — takes you on a step-by-step tutorial of setting up a site, using social media for promotion, and making money from your work.